How many high school graduates enroll in college is a frequently asked question. Enrolling in college right after high school graduation is common and increasingly important since income on average increases with each level of education beyond high school. In 2014, 69 percent of Minnesota's public high school graduating class of 2014 attended a postsecondary institution the following fall either in Minnesota or elsewhere. The rate includes students enrolling in Minnesota and out of state and at all types of colleges from vocational two-year to four-year. Minnesota's rate tracks with national trends. Note: college enrollment rates leave out students not graduating from high school. Since there are large gaps in Minnesota public high school graduation rates by race/ethnic background even less students who are American Indian, Black and Hispanic attend college than their White and Asian younger aged peers. New data from the Minnesota Statewide Longitudinal Data System (SLEDS) allowed calculating the participation rates by primary home language spoken, free or reduced-price lunch enrollment and out-of-state enrollment of Minnesota's public high school graduates. In general, White and Asian public high school graduates enrolled in college at rates higher than other populations. 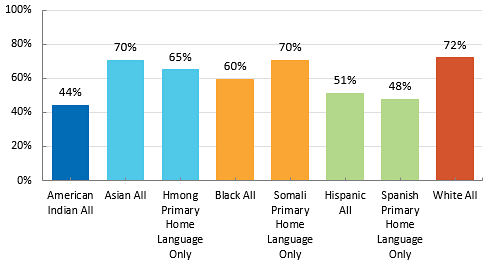 When calculating Minnesota high school student's race/ethnicity only compared to the three primary foreign languages spoken at home - Hmong, Somali and Spanish - variations occurred. Nationally, immediate enrollment in college also varies by race and ethnicity. Of the 3 million high school graduates in 2013, 66 percent, enrolled in college the following fall. White student college enrollment (67 percent) was higher than the rate for those who were Black (57 percent). The national rate for those who were Hispanic (66 percent) was similar to White students. The immediate college enrollment rate for Asians (81 percent) was higher than the rates for Whites, Blacks, and Hispanics in 2013 and in each year since 2003. College participation rates for high school graduates not receiving free or reduced-price lunch was 26 percent higher than students who received free or reduced-price lunch. 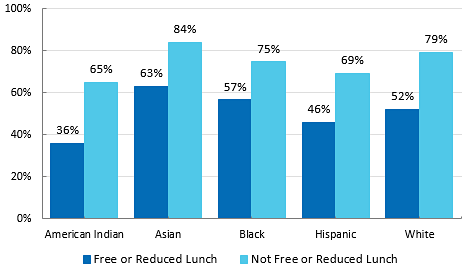 Income of public high school graduates was measured by whether the student enrolled in free or reduced-price lunch at any time during high school. College enrollment gaps by family income are also reported nationally. The college participation rate for high school graduates from high-income families (80 percent) was 31 percentage points higher than the rate for those from low-income families (49 percent). Minnesota needs to break the cycle of lower-income students or students of color lower college participation rates. Minnesota's challenge moving forward is to successfully prepare and support underserved populations to certificate or degree completion while meeting future workforce demands in a period of changing demographics. Minnesota needs to increase access to degrees that open doors.